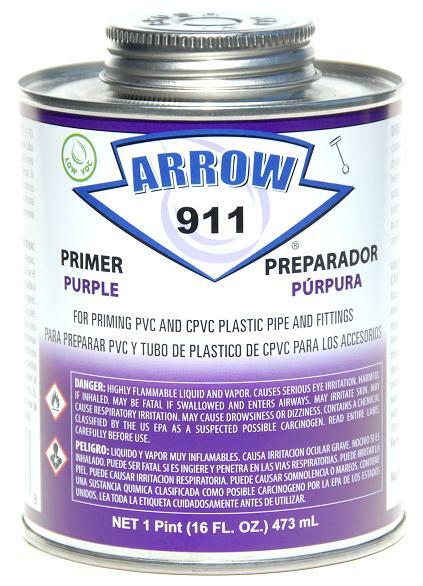 911 is a Low-VOC, very aggressive and fast acting Primer for use on all classes and schedules of PVC and CPVC pipe and fittings. The Primer will deeply penetrate and soften the joining surfaces of the pipe and fittings. Listed by NSF International for compliance with ASTM F 656, the Uniform Plumbing Code (Purple only), NSF/ANSI Standard 14, NSF/ANSI Standard 61 for use on potable water, drain, waste, vent and sewer applications (pw-G-dwv-sw) and NSF/ANSI Standard 372 ‘lead free’. Premium formulation for use in all PVC and CPVC piping systems, specifically recommended for Schedule 80 and large diameter applications. Ideal for use in cold weather applications. 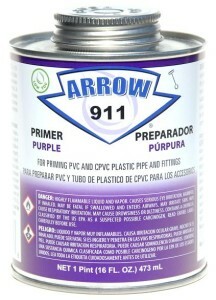 Use of the purple color provides for easy identification that primer has been used on joining surfaces.